All UK Mazda model ranges are now included in the Motability programme with some available at no advance payment. The programme, which will run through to March 31, 2015, sees 81 out of 97 derivatives available from the Mazda2, Mazda3, spacious seven-seat Mazda5 people carrier, Mazda6, the Mazda CX-5 compact crossover and iconic Mazda MX-5 two-seater. Mazda introduced the Mazda3 and the Mazda CX-5 to the Motability programme in the final quarter of 2014 and impressive demand has led Mazda to ensure both those models remain available alongside almost all other derivatives across the manufacturer's line-up, with the Mazda3 2.0 120ps SE five-door being available at no advance payment and the SE Nav model for an advance payment of just £99. Mazda Head of Fleet Steve Tomlinson said: "Mazda's Motability programme now gives people in receipt of the Disability Living Allowance, the widest choice of vehicles ever. The entire and perennially popular Mazda2 range is available on-the-road from £11,195 with a choice of 1.3-litre 75ps and 84ps engines and as a 1.5-litre 102ps automatic and all models come with nil advance payment terms. Automatic variants are favoured by many Motability customers and they are available across the Mazda range with the exception of the Mazda5, for which on-the-road prices start at £20,495 and there is a choice of 2.0-litre 150ps petrol or 1.6-litre 115ps diesel engines for the high seat, easy slide-door access model. 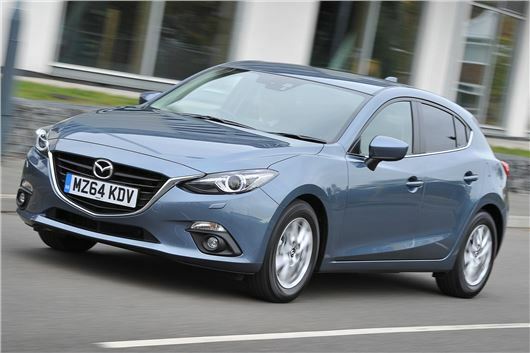 The Mazda3, available in a choice of Hatchback and Fastback (saloon) bodystyles, was launched a year ago and since being added to Mazda's Motability programme is proving extremely popular. Available with a choice of low emission, fuel-sipping SKYACTIV petrol and diesel engines - only the 1.5-litre petrol model is not included on the programme - on-the-road prices start at £16,995 for Mazda's best-selling model. Similarly, the Mazda CX-5, which triggered huge demand when it joined the programme three months ago making it the brand's most popular Motability programme car in 2014/15, is also available with a choice of the full range of SKYACTIV petrol and diesel engines, as well as two automatic options with on-the-road prices from £21,895. The family-sized Mazda6, which is available in both Saloon and Tourer bodystyles, costs from £19,595 on-the-road and is also available with a choice of SKYACTIV petrol and diesel engines with only the 2.2-litre 175ps variant excluded from the programme. Finally, the Mazda Motability programme line-up is completed by the Mazda MX-5, the world's best-selling two-seater sports car, with on-the-road prices from £18,495. Each model offers Motability programme users a comprehensive choice of specification across a wide choice of model grades, as well as competitive pricing delivering excellent value and first-class performance.